I had seen this all over Pinterest and I knew I had to try these for my kids. 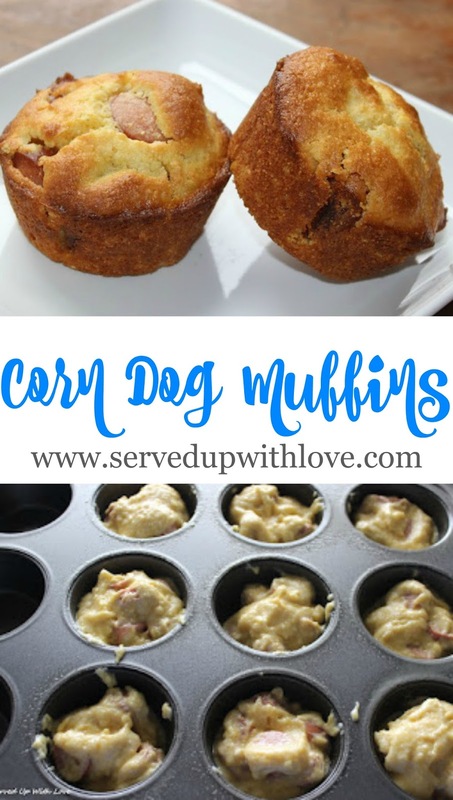 I have tried the homemade corn dogs before and they are good, but these are so much easier. Sometimes I find it hard to find something that both my kids will eat at the same time. My son seems to be getting a little picky here lately. He just does not realize how much of a pain this is for me trying to fix food for them. I did not know if he would eat these, but he did and loved them. In fact, he wasn't too happy with me that I made them because he kept going back for more. So that was a winner for sure. I have come to the conclusion that he is now 16 and if he doesn't want to eat what we have for dinner, he is old enough to find something for himself. I don't have time to be a short order cook. Once you mix them up, spray a muffin tin and place in the oven. Mix corn muffin mix according to directions on the box. Cut up hot dogs and mix into the mix. Spray the muffin tin with cooking spray and fill half way. Bake according to package directions. Enjoy. Thanks Krista...I enjoyed them as well! He will love them and you seriously can't get any easier than this! Look forward to see how he likes them. Cant wait to see how he likes them! What an awesome Mom you are! Ugh I am not looking forward to school starting, we start the day after labor day here.